There’s a saying in the US – if you don’t like the weather, just wait a minute it will change. Actually, we have been enjoying the lovely, early fall open window weather of late, but for the last few days summer has returned. No complaints, but it IS October. Summer weather combined with two weeks of very long, stressful days at work found me searching for easy to prepare, light and satisfying dinners. (It’s too easy to succumb to exhaustion and think about ordering a pizza.) Oli to the food rescue when he sent me his tabbouleh recipe for the blog. Although it isn’t a main course, tabbouleh is a fantastic, healthy side with grilled chicken, fish or whatever. I was reminded of our Mezze post: Home Made Falafel, Pita Bread and Hummus . Tabbouleh belongs there as well. My parents had Lebanese, Syrian, and Armenian friends, so growing up I was introduced to the fabulous flavors of the Arabic kitchen, and of course among the many dishes we enjoyed, tabbouleh was a frequent flyer. 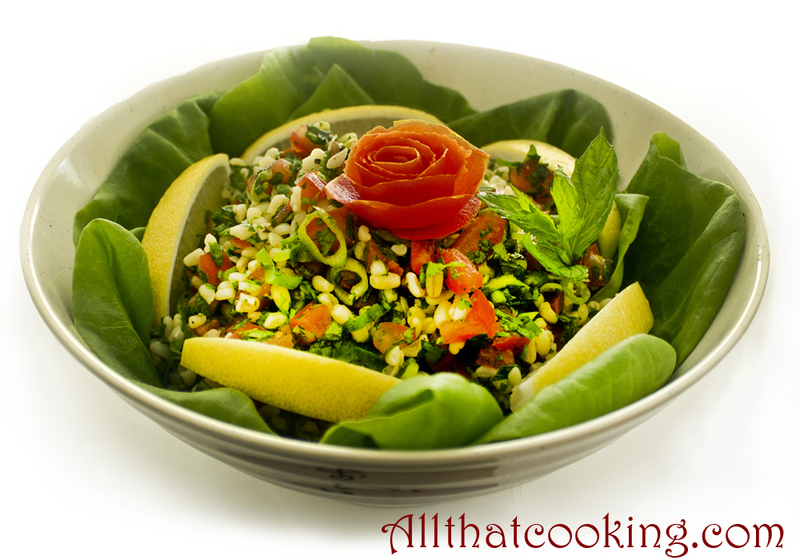 Our Lebanese friends prepared tabbouleh with a dash of cinnamon and clove which is traditional in Lebanon. Sometimes they dusted the salad with a Lebanese seven spice blend. 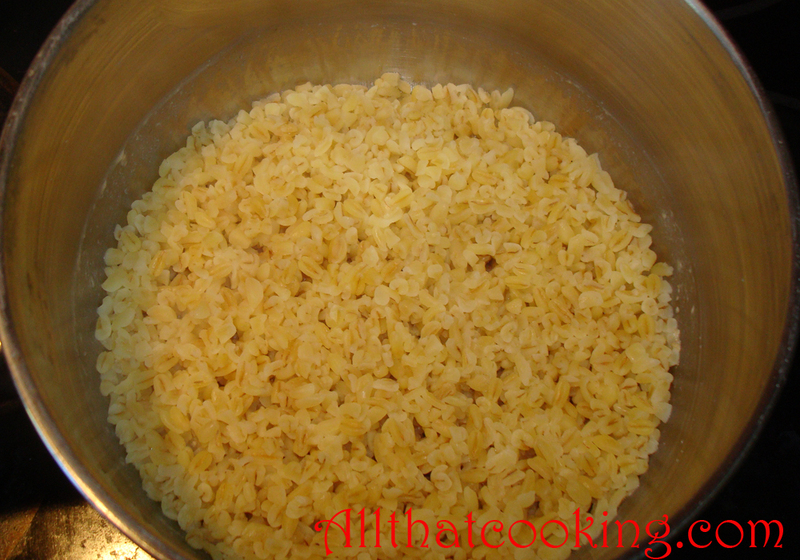 (Equal amounts of ginger, cloves, coriander, cinnamon, allspice, black pepper and nutmeg.) I remember a tangy herb salad, with a bit of bulgur just wandering through the roughly chopped greens. Thank you Oli for bringing up some fond childhood food memories! Oli’s tabbouleh is tangy, refreshing, quick and easy to make. I pared with grilled chicken, added a side of feta cheese and a glass of my favorite red. Needless to say, it was an oasis in the middle of a desert of stress. The key to a great tabbouleh is fresh, fresh, fresh everything and firm, ripe tomatoes. 1. 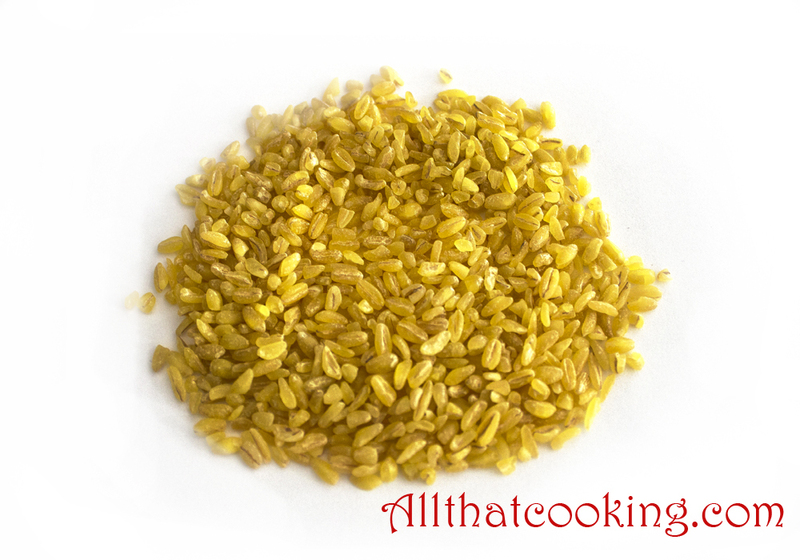 Since bulgur is a natural produce, water amounts and cooking times vary. We suggest following the package directions. 2. 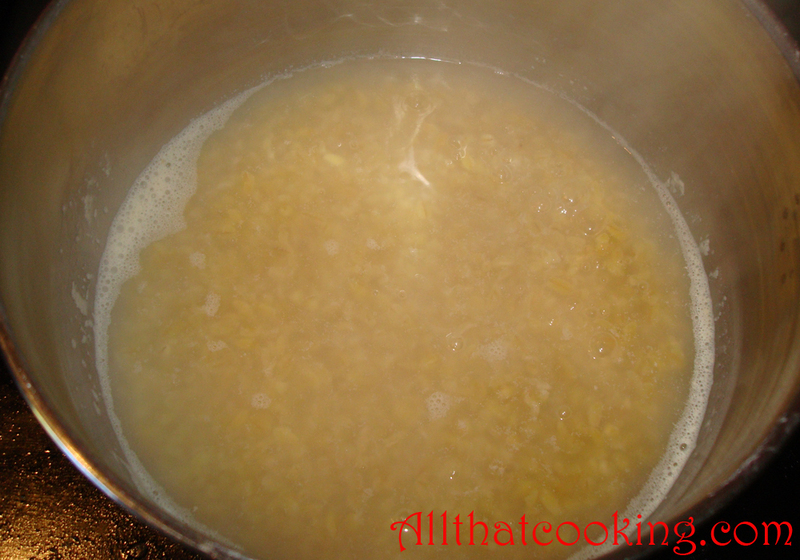 When cooked, remove pot from heat, transfer bulgur to a large bowl and let it come to room temperature. 3. Toss in tomatoes, scallions, shallot, garlic, parsley, mint, lemon juice, olive oil and the pepper. Gently mix to combine. Serve with lettuce leaves and lemon wedges. If you would like to see how to make the tomato rose click here. Gallery | This entry was posted in Appetizers, Sides and tagged bulgur wheat, herb salad, Mezze, tabbouleh, vegan, vegetarian salad. Bookmark the permalink. Good Lord! Look at that gorgeous, vivacious bowl of rainbow goodness! Your pictures are so magnetic! And thanks for introducing me to this fragrant dish; which I’ve never heard of. Hugs. Love. Take care, darl.